Bluewater lagoon Boats with their chine hull design, higher freeboard and deeper hull are more substantial than a longboat. This configuration also allows for an extremely fuel efficient hull which why it's a favourite choice for local businesses. Bluewater lagoon boat offers the flexibility of a craft that is equally at home in shallow waters of the lagoon or the open waters of the deep blue sea. Able to be outfitted with up to 150hp engines the Bluewater Lagoon boats effortlessly cut through the waves and are available in numerous sizes and design configurations. 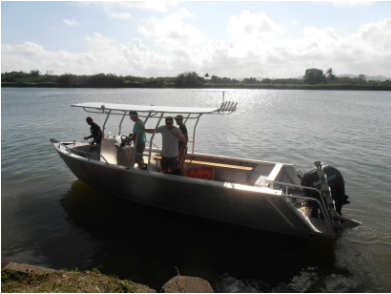 This boat was commissioned by Fiji Surf Co. and features a large canopy (for sun protection), open transom for easy loading and access, surf racks on top, and Bluewaters famous boarding ladders. The boat is powered by twin 60hp Yamaha 2 stroke outboard engines or could be powered by a single 115hp 4 stroke. Twin engines offer the flexibility of always having a backup should one engine develop a fault. We are flexible enough to let our customers decide on brand, single/twin engine and power output.